President Barack Obama is doing his part to support small businesses. Obama and daughters Malia and Sasha dropped in Saturday at Washington’s Politics and Prose bookstore and purchased what he said was a “long list” of books that included “The Kite Runner,” ”Harold and the Purple Crayon,” and “The Sports Gene”. The president said he bought a reader for every age, from 5 to 52 – his age. 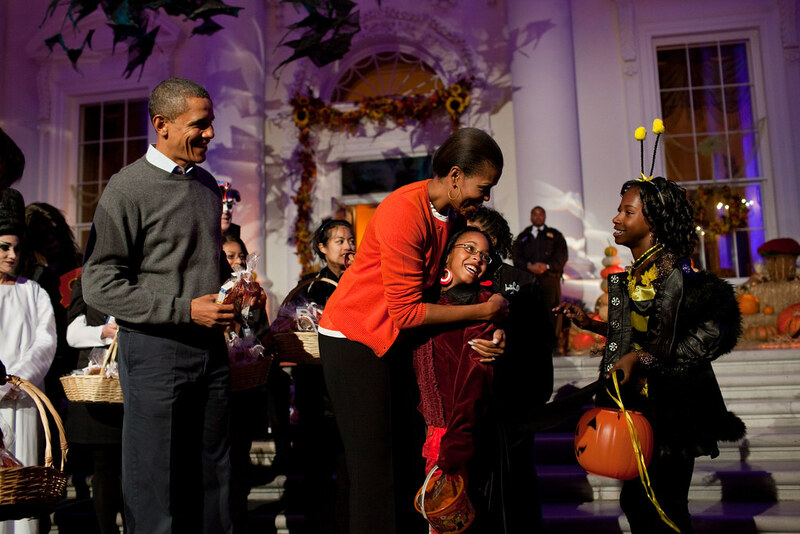 Obama sent a tweet earlier Saturday about the importance of supporting small businesses. 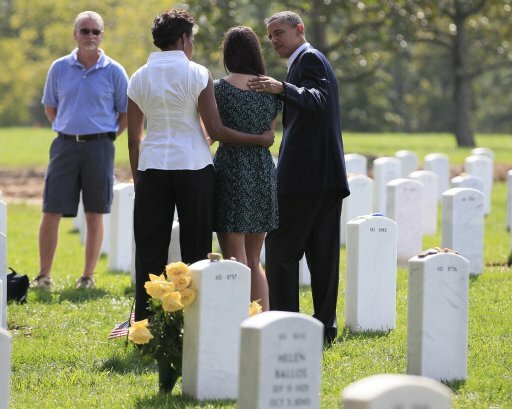 President Barack Obama and first lady Michelle Obama visit Arlington National Cemetery, Sept. 10, and pay their respects graveside with other visitors. White House statement: The President and Vice President met with Speaker Boehner, Leader Pelosi, Leader Reid and Leader McConnell in the Cabinet Room to discuss options for ensuring that the debt ceiling is raised and the United States does not default on its obligations for the first time in its history. The President restated his opposition to a short-term extension of the debt ceiling, explaining that a short-term extension could cause our country’s credit rating to be downgraded, causing harm to our economy and causing every American to pay higher credit cards rates and more for home and car loans. As the current situation makes clear, it would be irresponsible to put our country and economy at risk again in just a few short months with another battle over raising the debt ceiling. Congress should refrain from playing reckless political games with our economy. Instead, it should be responsible and do its job, avoiding default and cutting the deficit. The meeting lasted approximately one hour. The leaders agreed to return to Capitol Hill to talk to their members and discuss a way forward, and conversations will continue throughout the day. MediaLife: “60 Minutes” landed a big scoop with President Barack Obama’s first interview after the killing of Osama bin Laden, and it delivered a big audience. “Minutes” averaged 13.8 million total viewers at 7 p.m. last night, according to Nielsen overnights, up 29 percent over the 10.7 million who tuned in last week. The interview was easily Sunday night’s most-watched show on broadcast, with the No. 2 program, ABC’s “Desperate Housewives,” drawing about 4 million fewer viewers. There have been endlessly frustrating problems with the OFA site since I started ‘The Obama Diary’ fundraising effort for Obama/Biden 2012 yesterday, lots of you have had trouble with the link – I’ve contacted OFA to let them know about the problems, but the automated reply said it could be a “few weeks” before they get back to me. Insane – people want to donate to the campaign and they can’t! Any way, thank you so much to those who persevered and helped bring the total up to $830 today, just $170 short of the target. If any of you could manage $10 or more to bring it to $1,000 that would be great, but absolutely no worries if you’re not in a position to donate – as I said before, these are really difficult times for many of you. This in the link – I hope it works! “Sixty-three years ago, when Israel declared its independence, the dream of a state for the Jewish people in their historic homeland was finally realized. On that same day, the United States became the first country in the world to recognize the State of Israel. As Israelis celebrate their hard-won independence, it gives me great pleasure to extend the best wishes of the American people to the people of Israel and to honor their remarkable achievements over the past six decades. Our two nations share a unique and unbreakable bond of friendship that is anchored in common interests and shared values, and the United States’ unwavering commitment to Israel’s security. I have every confidence that the strong relationship between our countries will grow deeper with each passing year. This is a period of profound change in the Middle East and North Africa, as people across the region courageously pursue the path of dignity and self-governance. Just as I know that Israel will always be one of our closest allies, I believe that the region can be more peaceful and prosperous when its people are able to fulfill their legitimate aspirations. GOPolitico: Rick Perry has declined the White House’s request that he greet President Obama when Air Force One lands in Texas on Tuesday, the Republican governor’s office says.